Waterfront living at its finest. Enjoy all the bells and whistles in this well curated custom home. Relax in the stunning living room with wet bar leading to a well appointed office with gorgeous water views and entertain in style in your gracious dining room. The open floor plan lends itself for multi generational living with its elevator to all 3 levels. The cooks Kitchen is certainly the heart of the home w/granite, pull out drawers, SS appliances, supersized walk in pantry and eat in area. The 2 story Family room is inviting with its fireplace acesorized by a wall of windows taking in the glorious sweeping lawn and water views. Master suite enjoys 2 walk in closets & sitting area. The 3 additional bedrooms & 2 baths complete the 2nd level. The 3rd floor has a fab bonus room w/ full bath. Walkout Lower Level boasts a rec room, wood burning fireplace, fun bar, built in wine racks & is plumbed for 2nd kitchen. Laundry rm has gorgeous views of the yard, Priced to sell! Custom built, one owner!! - home offering some of the most panoramic views in all of bartlett 4/5 bedrooms, 3.1 plus baths, full finished walkout basement and 3.1 plus car garage. Rare 1st floor master bedroom. Solid wood 6 panel doors, wood floors and crown molding thoughtout. Remodeled kitchen with gorgeous amish cabinets, granite counters, newer appliances, and access to deck overlooking pastoral setting. Master bedroom with luxury bathroom and new custom closet organizers. Family room with floor to ceiling masonary fireplace and full wall windows, custom built-in wall unit all overlooking country skyline!! 3 bedrooms upstairs and open loft. Finished walkout basement with lovely custom oak wet bar, full bathroom and 2 bedrooms.. Zoned heating and cooling. New deck 26 x 20. Note unincorporated cook county taxes and over 2 private acres!! 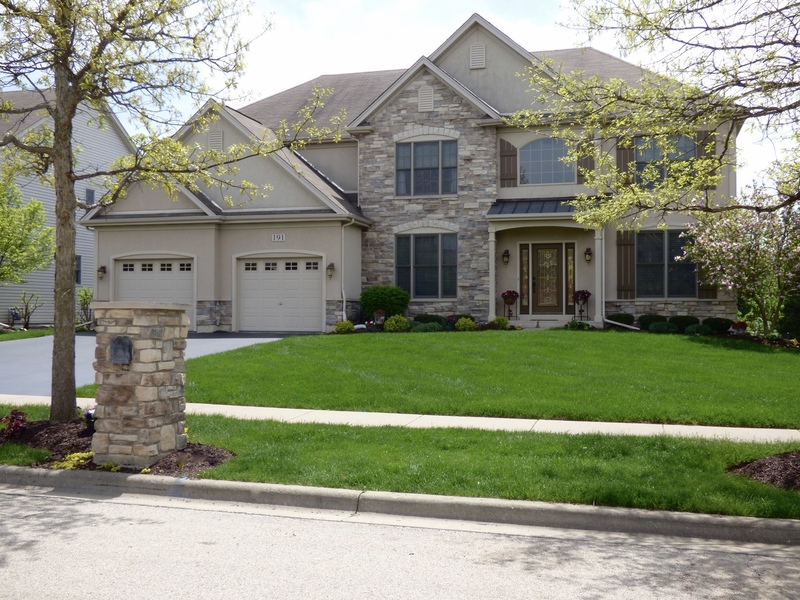 Custom Built Keim Home Made to Create Traditions.....Handsome 5 Bedroom, 4 Bath Radiates Quiet Quality. Nestled in the Durwood Forest of Bartlett High on a Hill, Surround by a Wooded Lot. Foyer with Grand Staircase, Triple Crown Moldings and Maple Hardwood Floors. Professional Chef's Gourmet Kitchen with Decor 42" Maple Glazed Cabinetry, SS Sub-Zero Refrigerator, Thermador 6 Burner Cooktop, Custom Hood, Built in Oven, Warming Drawer, and Blue Eyes Granite Counters. Kitchen Features a Custom Entertaining Island with Built in Cabinetry, Wet Bar, Wine Cooler and Media Center. Fully Applianced Prep-Kitchen. 1st Floor Bedroom/Office, 1st Floor Bath with Shower. Dramatic Family Room with Brick Fireplace, Vaulted Ceiling & Skylights. Master Suite with Vaulted Ceiling, Whirlpool Tub & Shower. 2nd Suite with Shared Bath. Four Season Solarium Room Heat A/C. Finished Basement with Built in Cabinetry, Tons of Storage, Wine Cellar and Cedar Closet. Buy This Home w/ Confidence 1yr AHS Warranty. TREAT YOURSELF to this Private Estate Home nestled on just under 3 Acres of Land in Unincorporated Bartlett-offering many possibilities as well. Enjoy it for the Large 4 to 5 Bedroom Home w/HUGE 30' x 13' Screened in Patio, an expanded PERGALA, a Finished Basement, 2.1 Bathes, Attached 2+ Car Garage-PLUS Separate 1000 +/- Sq.Ft. Heated Building ideal as Private Artists Studio, EXERCISE ROOM, a Personal Retreat Center. This property is ready to Host those HIGH ENERGY Individuals needing a HOME BASE capable of Hosting many various ACTIVITIES. Property may be Subdividable with potential for a driveway into the adjoining Subdivision. This is a Home/Property that MUST BE SEEN IN PERSON to Appreciate all of its Potential Uses. Home is covered by a 1 year CHOICE Home Warranty too! Check out that view! Nestled on a peaceful private lake this beautifully updated 5 bedroom 4 full bathroom home will steal your breath away. Enjoy the huge wrap around deck this summer with your family & create life long memories! From the eat in kitchen with granite counter tops and stainless steel appliances to the impressive master suite to the finished walk out basement you will enjoy the view from almost every room in this home. As you enter the home you will be immediately greeted with an impressive two story foyer and dramatic staircase. A formal living room and dining room are wonderful for entertaining and with the kitchen open to the family room hosting guests by the fireplace makes it even more enjoyable. The finished walkout basement offers an additional bedroom. This could be a wonderful in-law arrangement boasting a full bathroom, a fireplace, as well as a rec room with a breakfast nook, custom bar and pool table. Also, first floor bedroom as connecting full bathroom.